Meenakari Jewellery Lookbook: For All the Brides That Love Colour. 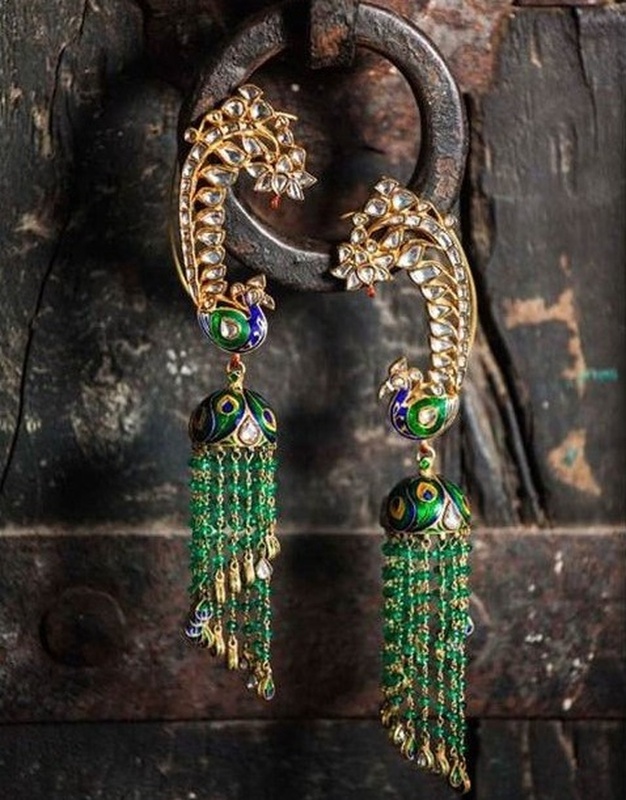 Meenakari refers to the craft of decorating the surface of any metal with colours in intricate designs. It was originally used in the adornment of Mughal palace walls before it was incorporated in jewellery. Introduced to artisans in Rajasthan by Raja Mansingh of Amer, it was initially used to beautify the back of traditional Polki diamond jewellery. Later, it took the wheel in becoming its own form of jewellery and a rather well-known, widely-used one. It is usually done on gold with nature inspired designs of birds, animals, flowers, etc. but other metals can be used as well. The price can vary on the karat of the gold and how much of it is used as well as the intricacy of the Meenakari work on it. On an average, a necklace could cost around 70,000-80,000 rupees. A good way to maintain Meenakari jewellery is to clean it with lemon and tamarind so its colour remains intact. How is it Meenakari jewellery made? The design, once created, is crafted into shape on a metal surface. The surface is then engraved in the required design, leading to grooves in the metal that would hold the colour. Enamel dust of the desired colour is then added to the grooves carefully after which each colour is fired individually so the heat can melt it and the liquid gets spread equally in the groove. Colours that are most heat-resistant are applied first as they are re-fired with each colour that is added. White is always applied first and red is the last. Each step is carried out by a seperate skilled artisan. For a silver base, only green, yellow or blue are used as they stick with it. As for gold, all colours can be used and hence, it is the most preferred metal for Meenakari. Where is Meenakari jewellery found? Jaipur is the main centre of Meenakari. Delhi and Banaras are other important centres. Nathdwara, Bikaner and Udaipur are famous for their silver Meenakari. Pratapgarh is known for glass enamelling. Check out these visuals for a detailed idea! Click here for info and inspo on more jewellery!